There is no more important issue to discuss than tax reform. Committee staff requested that I focus my attention on 59 provisions that expired at the end of 2011 and are commonly referred to as “traditional extenders.” While I do not separate these 59 tax provisions into “the good, the bad, and the ugly,” my goal is to provide you with a general framework for evaluating any tax provision. And since 46 of these 59 tax provisions generally relate to business taxation, the majority of my testimony is devoted to corporate tax reform. The most basic goal of tax policy is to raise enough revenue to meet the government’s spending requirements with the least impact on market behavior. But the United States’ tax code has long failed to meet this aim: by severely distorting market decisions and the allocation of resources, the tax code hampers job creation and impedes both potential economic growth and potential tax revenue. To increase employment and expand their economies, most developed countries are both reducing their corporate tax rates and restructuring their corporate tax systems to make them simpler. The United States appears to be taking the opposite approach. The very fact that we are here to discuss the dozens of tax provisions that expired last year alone is evidence of the tax code’s complex and temporary nature—two faults that increase both uncertainty and costs for American businesses. This drives competitive, profitseeking corporations to minimize their tax exposure and defer income overseas to lower tax countries. Unless the United States reforms its corporate tax system, the country will fall further behind in global competitiveness. While there appears to be widespread agreement on the need for tax reform, there is no consensus—either between or within parties—on specific elements of reform. To move the debate forward, policy makers need to know the goals of successful tax reform and what steps to take to achieve those goals. WHAT ARE THE GOALS OF TAX REFORM? Clearly, the nation’s increasingly dire economic and fiscal situation has increased the motivation—and the urgency—to reform the federal revenue system, along with the federal government’s other unsustainable institutions and practices. But what would an “ideal” tax code look like? SIMPLE. The complexity of the tax system makes it difficult and costly to comply with the tax code. Congress should make the tax code as simple and transparent as possible so as to increase compliance and reduce compliance costs. EQUITABLE. Policies intended to benefit or penalize select individuals and groups riddle the tax code; these policies also result in immeasurable unintended consequences. Fairness is subjective, but “tax fairness” would at least reduce the number of provisions in the tax code that favor one group or economic activity over another. The government should not be in the business of picking winners and losers. EFFICIENT. Because the tax code alters market decisions in areas such as work, saving, investment, and job creation, it impedes economic growth and reduces potential tax revenue. An efficient tax system must provide sufficient revenue to fund the government’s essential services with minimal impact on taxpayer behavior. PERMANENT AND PREDICTABLE. The negative effects of the current tax code result not just from what it does today, but also from what it may do in the future. Such uncertainty deters economic growth. An environment conducive to growth (and thus, increased revenues as a result of a larger economy) requires a tax code that provides both near and long-term predictability. Temporary tax provisions should be avoided. Further, instead of focusing on ways to increase revenue, focus should be directed on ways to increase economic growth, saving, and investment; a larger economy will result in larger tax revenue. We don’t just need more revenue—we need a better revenue system. WHAT REFORMS ARE MOST LIKELY TO ADVANCE THESE GOALS? LOWER RATES. Exhaustive economic research repeatedly proves this most basic effect: the more you tax capital or labor, the less you get. It also makes clear that incentives matter. Successful reform will lower current individual and corporate tax rates. One thing we should not do is raise tax rates. There is much research to support the negative consequences of raising tax rates on economic growth. Research by economists Christina Romer, former chair of President Obama’s Council of Economic Advisers, and David Romer suggests, “A tax increase of 1 percent of GDP reduces output over the next three years by nearly three percent.” Further, according to research by Harvard University economist Jeffrey Miron, “Both macroeconomic and microeconomic perspectives suggest that [higher] taxes slow economic growth, thereby limiting the scope for revenue gains.” To regain competitiveness, the US corporate tax rate should be reduced to at-or-below the 25 percent average rate of other Organisation for Economic Co-operation and Development (OECD) countries. BROADEN BASE, ELIMINATE LOOPHOLES. One of the keys to successful fiscal reform is to move away from a spending system that depends upon an easily manipulated income tax system. Tax reform should lower rates, broaden the tax base, and eliminate loopholes; this will increase stability, and lead to greater economic growth, added employment, and perhaps even increased revenues. NO DOUBLE TAXATION. For economic efficiency, it is important that income be taxed once and only once. There is much concern that those who report significant earnings from capital gains or dividends pay a lower tax rate than those with ordinary income. But this fails to accurately reflect the incidence of the corporate income tax. One of the reasons why we currently have a lower tax rate for individuals on capital gains is to account for the fact that capital gain income received by an individual was first taxed at the corporate level, up to 35 percent. Hence, if a corporation first pays the maximum statutory tax rate of 35 percent on each $1 of profit, leaving $0.65 of retained profit to either be distributed as a dividend or realized as capital gain, then combining the individual’s 15 percent tax rate yields a combined tax rate of 44.75 percent. REDUCE BAD INCENTIVES. Predictable tax policy is essential to long-term economic growth. Generally, temporary tax provisions should be avoided, especially when trying to correct or rectify a permanent problem. Further, allowing any provisions that favor one group or activity over another not only puts the government in the position of picking winners and losers, but also opens the Congress up to be influenced by those seeking special favors. This Committee has already held several hearings on the Tax Reform Act of 1986 (TRA86). TRA86 was remarkable for its bipartisan passage and sweeping reforms. But because the legislation failed to fix the revenue system’s large institutional problems, reforms were clawed back almost immediately. As a result, the tax code looks even worse today; in 1985 there were only 25 temporary tax provisions; in 2010 there were 141 provisions set to expire by the end of 2012. History has shown that tax reforms seldom last when special interests have large incentives to lobby Congress for tax breaks. Keeping the tax code as simple—by taxing a broad base at the same low rate—and transparent as possible will help reduce the ability and incentives to reverse future tax reforms. The current tax code is detrimental to our economy. Our tax system severely distorts market decisions and the allocation of resources; it hampers job creation and impedes both potential economic growth and potential tax revenue. Tax expenditures also set up a system where the government discriminates among taxpayers by picking winners and losers. Fundamental tax reform is ultimately the goal of this Committee. As you consider which tax provisions to extend or which ones should remain expired, promote provisions that level the playing field so everyone plays by the same rules and also those provisions that move toward fundamental reform over provisions that discriminate. Firms respond to high tax rates and relocate economic activity to lower tax countries. Thus, the current U.S. corporate tax structure places U.S.-headquartered corporations at a tremendous disadvantage in the global marketplace because other countries have lowered their corporate income tax rates to welcome multinational corporations. In December 2010, Japanese Prime Minister Naoto Kan said he hoped to stimulate Japan’s slow economy with a 5 percent corporate tax rate cut. The United Kingdom is undergoing a multiyear process to lower its combined corporate tax rate to 24 percent by 2014. Canada is attempting to lower its national corporate tax rate from 18 percent to 16.5 percent, giving it a combined rate of roughly 28 percent. Canada has good reason to do this. A recent study by Jack Mintz, head of the Public Policy School at the University of Calgary, estimated that a 3 percent reduction in Canada’s national statutory rate, from 18 percent to 15 percent, would create 100,000 jobs and draw $30 billion in additional business investment over a seven-year period. An independent study by the Canadian Manufacturers and Exporters found that a similar rate cut would create 98,000 jobs over a two-year period. The corporate income tax rate plays a major role in determining where a company will invest capital. Thanks to communications technology, companies doing business together often do not require physical proximity. Thus, if two countries are similar in culture, infrastructure, and economic growth potential and one has a dramatically lower corporate income tax rate, an entrepreneur or an expanding firm would be financially reckless to invest in the country with the higher corporate tax rate. U.S. firms are indeed moving away from the United States to initiate and expand business opportunities. U.S. corporations’ share of worldwide profits attributable to foreign revenue has increased from 6.7 percent in 1965 to 38.2 percent in 2009. A recent study in the journal Tax Notes showed that in 2004 multinational corporations shifted roughly $50 billion away from the United States to lower tax countries. This investment shift not only creates losses and impedes growth for firms, it also creates losses for American workers. Companies could have utilized such profits to create more U.S. jobs. With a tax rate so much higher than that of other countries, U.S. corporations must turn their accounting departments into profit-maximizing centers. Companies need complex financial engineering tactics to minimize revenue losses using tax code preferences. Through various transfer-pricing arrangements, accountants can allot income and capital to different countries to minimize tax liabilities and help companies to remain competitive. Companies can spend more time and resources using tax rules as profit centers than focusing on potential business investment. This system is inefficient: the resources used to combat the tax could be invested in intellectual or physical capital. Investment could help the company to grow, which would lead to more jobs and output and would expand the domestic economy. Instead, the high corporate income tax rate distorts firms’ incentive structures and investment behaviors. It sometimes becomes more “profitable” for companies to invest in lobbyists who can expand tax preferences than to use those resources to expand business output. Public policy should provide the proper structure to encourage growth. The current corporate tax structure forces firms to misallocate resources, causing a ripple effect throughout the organization’s financial structure. The higher U.S. corporate tax rate means that firms have to cut costs or raise prices elsewhere to compete with firms based in lower tax countries. Recently, both job creation and economic growth have been key topics among economic policy advisors. Restructuring the corporate tax system would address both issues. Policy makers debate the need for the federal government to continue investing in economic growth, yet such investment can do little good when current economic policies actually inhibit growth. When other countries have lower corporate income tax rates, firms may choose overseas destinations for business. Estimates of how many domestic jobs the current corporate income tax has killed range from 200,000 to 3 million, but the consensus is that many employees are terminated specifically because of the high costs imposed by the current corporate tax structure. During the 2000s, major multinational corporations reduced U.S. jobs by 2.9 million while increasing overseas employment by 2.4 million. Not all of these jobs were cut and outsourced specifically because of the corporate tax system. But was that system a contributing factor? Absolutely. Though outsourcing is no longer a popular trend, it remains an option for almost any multinational corporation seeking to reduce costs, including costs imposed by the corporate income tax. A tax upon a corporation is an additional tax on individuals. Many people view the taxing of corporations as if some faceless entity were paying the tax. However, corporations are made up of individual investors and workers attempting to earn money by maximizing profits. Companies are not the only ones affected by corporate tax rates either. Individuals are also affected when high tax rates force corporations to charge more for their products and services. The poorly constructed U.S. corporate tax is, thus, a form of double taxation on productive workers, consumers, and investors. A working paper by the Congressional Budget Office finds workers bear “slightly more than 70 percent of the burden of the corporate income tax.” Moreover, economists Kevin Hassett and Aparna Mathur found an interesting unseen consequence of raising tax rates. For every 1 percent increase in corporate tax rates, they found a 1 percent decrease in wages. This fact illustrates that corporations respond to incentives and allocate resources within given constraints and shows another way that individuals ultimately bear the burden of any corporate tax. The corporate income tax also impedes the country’s economic growth. A 2008 National Bureau of Economic Research (NBER) working paper concluded that a “10 percent increase in an effective tax rate reduces the aggregate investment to GDP ratio by 2 percentage points.” The NBER paper also shows that corporate tax rates are negatively correlated with economic growth. And, of course, lower economic growth leads to less job creation. Further, a higher tax rate may actually lead to lower tax revenue. The $50 billion that U.S. corporations shifted to lower tax countries in 2004 may have cost the U.S. government $17.4 billion in tax revenue. Indeed, corporate tax revenue in the United States is lower than that in other OECD countries, even as a percentage of GDP. 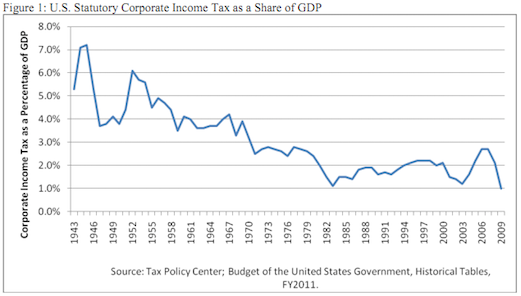 As figure 1 shows, even as the economy has grown, corporate tax receipts as a percentage of GDP have decreased and have remained fairly constant since 1990. A study by economists Alex Brill and Kevin Hassett shows significant evidence that lowering the U.S. corporate tax rate would enhance tax revenue. The uncompetitive U.S. corporate tax system impedes American corporations’ ability to compete in the global marketplace. It also discourages potential domestic investment. If the United States is to be competitive in the future, some level of corporate tax restructuring has to occur. While other nations have been racing over the last 20 years to slash corporate tax rates, the United States has stagnated. At times the government has enacted temporary changes to tax policy, but it has ignored the underlying, fundamental problems that need permanent reform. The United States has an infamously dense and complicated tax code that is in dire need of simplification. Temporary tax provisions only further the day of reckoning and postpone the tough choices that need to be made. Systemic problems exist not only in loopholes and tax havens, but also in the uncompetitive high corporate income tax rate and the worldwide-based tax system that encourages businesses to move jobs and investment overseas and to lobby for more loopholes. High corporate taxes lead to lower wages and investment and hinder long-term economic growth. To protect American jobs and secure future fiscal stability, the United States must slash its corporate tax rate. Absent sweeping corporate tax reforms, U.S. competitiveness will continue to languish. Inaction will create troublesome results: the foreign outsourcing of economic activity, a further loss of American jobs, the sale of U.S. companies to foreign multinational companies, a further erosion of the corporate tax base, and the continuation of harmful tax policies that are biased against saving, investment, job creation, and economic growth. Thank you again for your time and this opportunity to testify today. I look forward to your questions.